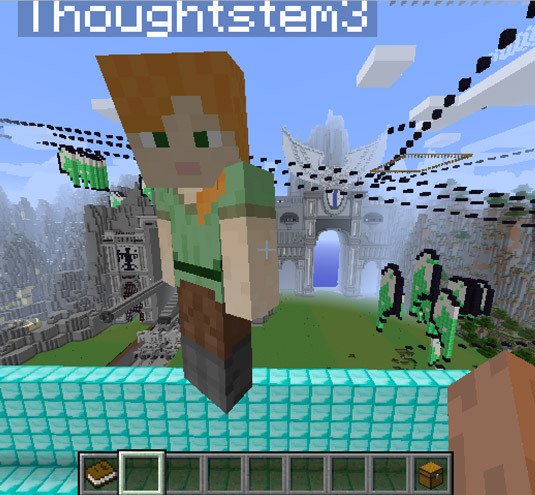 To test your multiplayer game, launch Minecraft and go to the LearnToMod server. Then type the command /open. This opens your Minecraft world to anyone else who has access to the LearnToMod server, but the only way they can get in is if they know the number that you see. You see this message, but your number will probably be different. Have a friend first join the LearnToMod server and then type the command /join ##, where ## represents the number displayed in your server when you type the open command. Make sure the Minecraft usernames that are in your Setup­Mulitplayer function are those of you and your friends. For example, if your Minecraft username is thoughtstem and your friend’s username is thoughtstem2, your SetupMultiplayer function would look like. 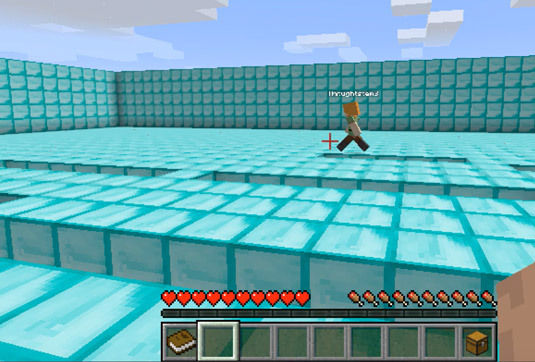 Click Mod in your LearnToMod account, and then run the yourgame_Multiplayer mod in Minecraft. You and your friend are teleported to the center of the arena. When one of you breaks the melon block in this game, you both should start making blocks below you disappear. Play the multiplayer version to make sure you have written all of the code correctly as you think it should be.